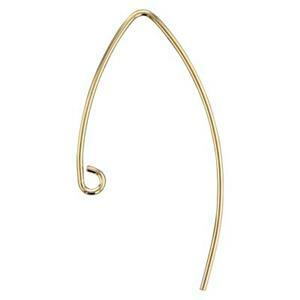 Earwire hook earring findings in sterling silver, gold filled and 14kt gold. Huge selection! Fancy ear wire earring findings in sterling silver and gold filled. More shapes and sizes! Ear wire earring findings range from very basic shepherd hook shapes to more modern forms such as v-wires or u-shaped hoops. 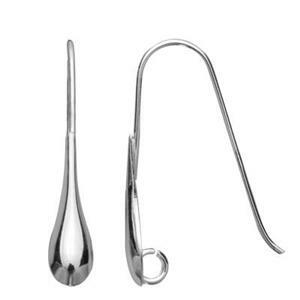 These earring making components may also be known as french hooks. The name does not refer to the nation of origin. French hooks do not come from France; the name is sort of like french fries! 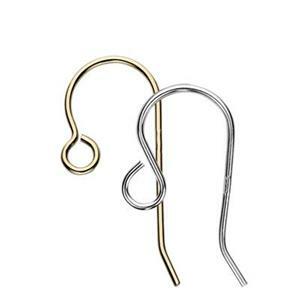 Earwires are the most popular type of earring findings in jewelry design because they are affordable and versatile. You can easily make your own but we offer many high quality options that will save you time so you can focus on creating great accessory collections instead of just shaping silver wire. Please note that we sell all our earring findings by the piece so a 10 pack contains 5 pairs, for example. Order in multiples of two for complete pairs. These jewelry findings are frequently purchased with headpins and charms. Learn about Types of Earring Findings in our helpful blog article.